A special flag is flying from County Hall to mark Armed Forces Day. The flag was presented to County Councillor Terry Aldridge, Chairman of Lancashire County Council, by Mrs Amanda Parker JP DL, Deputy Lieutenant for Lancashire, at a special ceremony. The flag marks the county council’s appreciation of the contribution made by the UK’s armed forces – past and present. It will fly until Armed Forces Day on Saturday 24 June. All councils across Lancashire and most of the country will be marking Armed Forces Day in a similar way. County Councillor Terry Aldridge, Chairman of the county council, said: “Armed Forces Day is our opportunity for us all to think about the people in our armed forces, veterans who have served their country, and the wider armed forces community. “Their dedication and sacrifice means that they can spend long periods of time away from home, often away from their families and friends. 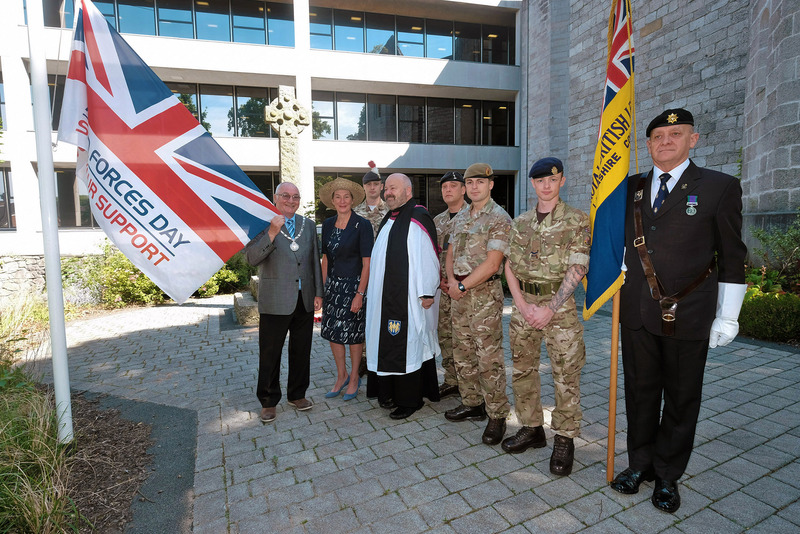 The flag handover ceremony was witnessed by soldiers from Fulwood Barracks, veterans from the Royal British Legion and senior members of the county council, together with UNISON members, both past and present; and Father Timothy Lipscomb, vicar of Preston and Chaplain to the Veterans.